In case of emergency, brick glass? 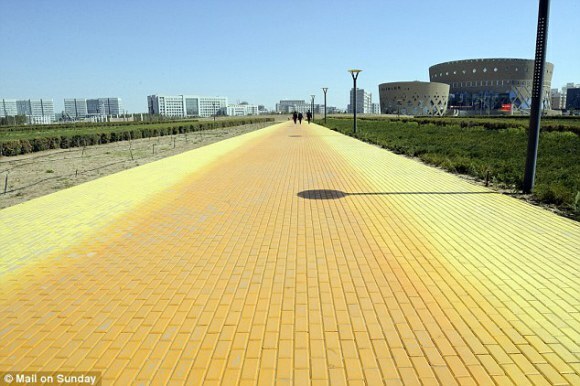 Goodbye, yellow brick, road? Have brick, will travel? 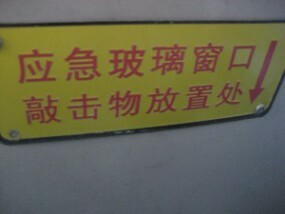 The puns come fast & furious when attempting to explain a low-tech safety measure found on Chinese passenger buses: yellow-painted, window-breaking bricks. Just in case their purpose is misconstrued, the yellow-painted bricks feature Chinese characters that translate to “for emergency use,” painted in bright red. 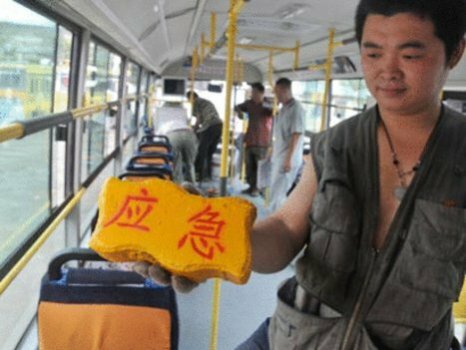 The Harbin Public Transport Company in the northeastern Chinese province of Heilongjiang has retrofitted around 300 of their 700 bus fleet with two bricks each, stored under the driver's seat and under one of the rear seats. The bricks replace special hammers meant to be used to break window glass and allow easy egress in the event of an accident. It's not known whether the other buses still have their original hammers or are cruising city streets with no emergency exit creation tools whatsoever - a frightening thought! Wouldn't a purpose-built hammer be easier for stunned and shocked accident victims to use? Perhaps, but... “The special hammers are expensive and people were always stealing them,” explained a spokesperson from the Harbin Public Transport Company. “We don’t think anybody will be interested in stealing bricks.” Famous last words? 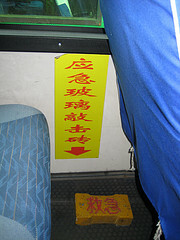 Bus companies in the south-central Chinese city of Xian, Shaanxi Province, have applied the brick technique to their buses as well, though with a slight difference in implementation. 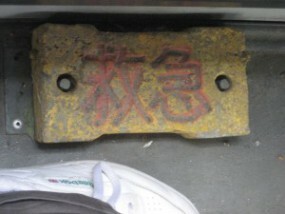 The bricks are still painted yellow with red lettering but are made with two holes that allow them to be mounted on pins to hold them steady while the bus operates normally. You'd think a bright yellow brick fastened to the wall at eye level would be enough to attract notice but just in case, each brick is accompanied by a stamped steel sign explaining the brick's purpose. Ditto for floor-mounted bricks, and note the red arrow pointing to the brick itself.